Walking through the streets of Montreal, I was unsure what I should expect from Ancestors: The Humankind Odyssey. It had the pedigree to suggest it could be the next big thing—taking the adventure game formula back to the dawn of man—and it was an intriguing concept that has had me excited since the first trailers hit YouTube. With Patrice Désilets, creative director of Assassin’s Creed on the team, the talent was there to make something special. It was with this mindset that I stepped into the small studio and readied myself to spend some time with the game. When Désilets sat down with the small group of writers, his passion for the project was immediately evident. Watching him load the game for the first time made it clear that Ancestors would quickly become something more exciting than a simple trailer could adequately explain. 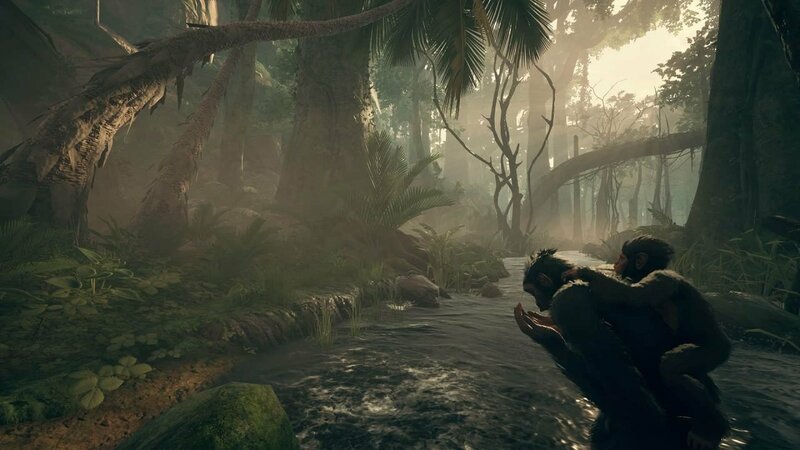 Set in the Africa of 10 million years ago, Ancestors: The Humankind Odyssey manages that odd mix of feeling familiar and new all at the same time. Within minutes of picking up the game, the controls felt fluid and intuitive. Much like Assassin’s Creed, the action button is used to grab and climb, with additional buttons for intelligence (understand the world around you), sense (spot danger etc. ), and communicate. It is a genius system because even though the game never feels easy, you will find yourself comfortable with experimenting and trying new things within the first hour of playing—and experimentation is the key with Ancestors. You play as a group of early primates that still doesn’t fully understand the world around them. It is up to you to explore, try out, and test your limits to push your tribe to evolve. Even with the simple levels of communication present in Ancestors, few games have felt more human in the first minutes. The raw, visceral nature of the universe the game creates was immediately evident. The sense of fear, powerlessness, and overwhelming odds are ever present. You are a small tribe of hominids, struggling to survive in a world wanting nothing more than to make you food. Each new fruit you eat, rock you pick up, or bed you make will help your evolution, and these traits, much like an RPG, will make the overall gameplay experience more comfortable, and as time goes on, rewarding. Granted, not all things you try in the world will be friendly, but that is all part of the experience. While it is an immediately understandable game, it is by no means a comfortable experience. In the short two hours I was able to play I managed to die over five times, with many of the deaths being long, drawn-out struggles as I tried to get to safety with a broken leg. The survival element is ever present, with the constant need for food, sleep, and water always present—you can also die on one of the many quests available. Much like a Souls game, there is real consequence to death. If you die with a baby on your back, you will need to rescue them. Your lives are dependent on there being adult bodies in your tribe left to jump into. Your tribe members basically act as your lives, and once they run out, that is it for your time in Ancestors. While it may be stunning to look at, it is always evident that behind the beauty rests danger. The developers at Panache have done a strikingly good job at making this ever-present. From the way your display will glow when your character feels fear to the way the opening scene shows the level of danger in the world, you will never feel completely safe while in the wilds of Ancestors. 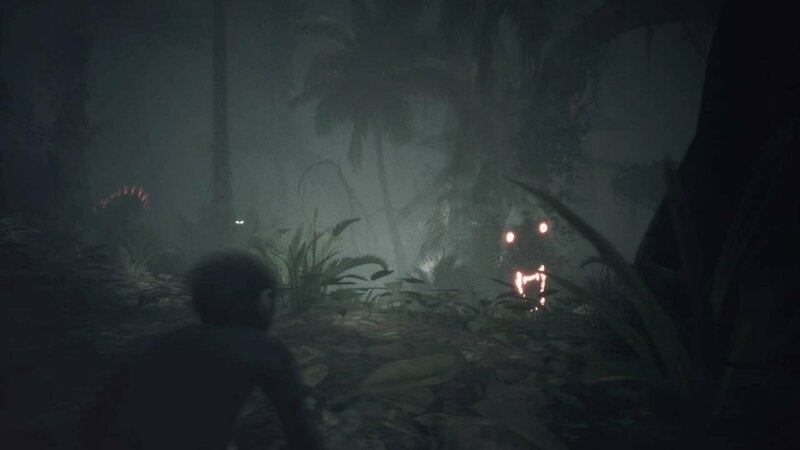 Giant snakes, birds, large cats… there is always something looking to make a meal of you, and it will take all your skills to avoid a grim fate. While this may sound brutally difficult at times, Ancestors manages that balance of paying off each challenge it sets before you. For every heartbreaking fall I suffered on my way up a tree, the feeling of making it, and finally getting a few tribe members across the forest more than made up for it. There is such beauty and humanity within Ancestors that it is hard to deny it is merely a fun game to explore and spend time in. 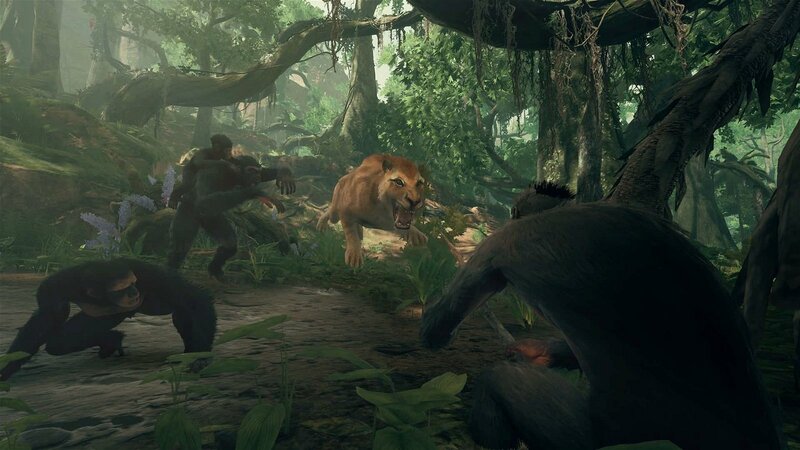 Now, as with any game of this nature, it is hard to say what the final experience will be like, especially when the team at Panache Digital Games are aiming for a full 50-hour experience spanning millions of years’ worth of evolution, but if they can keep up this level of interest there is real potential here. Patrice Désilets and the team at Panache Digital Games have a lot of talent and they are throwing it all at Ancestors, and while it may not be for everyone, what they have built feels unique, exciting, and special. As I walked away from the studio and boarded my plane, I felt that if they pull it off it could be a new landmark for narrative design, but for that, we will need to wait for the final release. 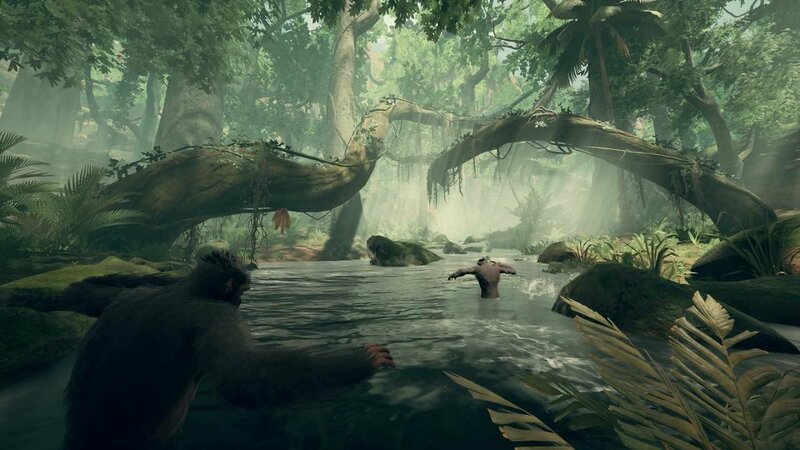 Ancestors: The Humankind Odyssey is slated for release on PC, PlayStation 4, and Xbox One in 2019 for a digital-only launch.